The January 1948 Journal of Home Economics notes that a "Home Workshop at School" was established. In the new Homemaking Center of Langley High School girls will learn to operate the most modern home equipment from automatic dishwashers to electric ironers. "Gone", the article continues, "is every vestige of laboratory appearance at this center; instead, the department consists of a beautifully decorated living room, furnished for practical living purposes, and a kitchen-laundry area". ... The living room is large enough for meeting and discussion purposes and ideal for entertaining. In two large cupboards on either side of the fireplace, one finds roll-away beds and equipment necessary for teaching home nursing and child care.The kitchen area has five gleaming kitchens. Each of the units, which include a range (gas or electric), sink unit, built-in cabinets, refrigerator, and tables and chairs, could fit perfectly into any modern home setting because only home or domestic equipment has been used. Equipment includes waffle irons, coffee makers, mixers, and toasters as well as cooking utensils, flat silver, and linens. In all kitchens convenience outlets are adequate and well placed, and cabinets are designed to give maximum convenience. The living room is separated from the kitchen-laundry area by folding, accordian-like plastic doors which can be thrown open to make one large room and provide space for setting up folding chairs, thus converting the room into an auditorium for demonstrations and lectures. There is no rubbing, wringing, or hanging up of clothes in the laundry or utility room because it includes new automatic equipment, even an electric clothes dryer; all of which eliminates "blue-Monday" worries from the homemaker's schedule. In a brochure which describes this new homemaking department, Earl A. Dimmick, superintendent of Pittsburgh public schools, says that to meet technical advances made in home equipment it is essential that classrooms be redesigned and re-equipped on a more practical basis. He adds, "We hope the type of layout we have at Langley will be the pattern for home economics in the city of Pittsburgh." In the 1930's and early 1940's the Pittsburgh Equitable Meter and Manufacturing Company -- a conglomerate corporation comprising firms manufacturing products from water meters to ball bearings -- acquired several manufacturing companies, including Delta Manufacturing Company of Milwaukee, Wisconsin and Rockwell International Corporation of New York. In January 1, 1946, the companies owned by Willard Rockwell and his investors incorporated as the Rockwell Manufacturing Company, with more than 4,000 workers. After World War II, the economic engine generated by war-time mobilization continued. The growing demand for woodworking machinery encouraged Rockwell to purchase Red Star Products of Norwalk, Ohio. 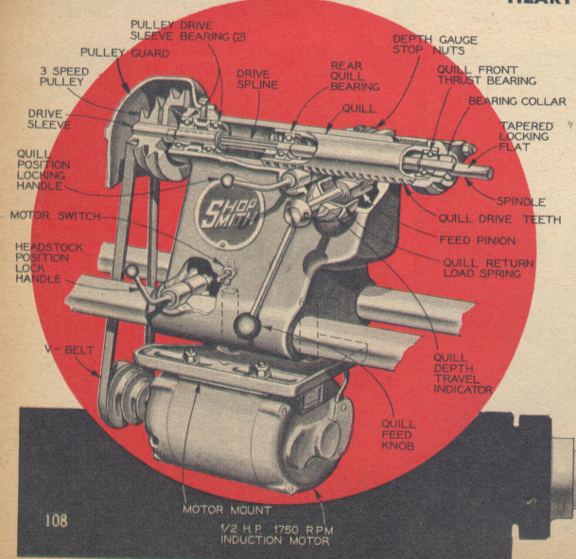 Red Star was the manufacturer of the "Multiplex" brand of radial arm saws. With the addition of Red Star, the Rockwell company comprised 17 different subsidiaries from coast to coast manufacturing machine tools, meters, valves, control devices, and computing mechanisms. The Red Star radial arm saws would be sold through existing Crescent and Delta dealers under the Delta brand. In July, 1949, Rockwell consolidated several of its subsidiary's plants -- the Crescent Machine Division of Leetonia; the Arcade Manufacturing Division of Freeport, Illinois; Red Star Products, Inc. of Norwalk, Ohio; and Delta Manufacturing Division of Milwaukee, Wisconsin -- into the "Power Tool Division" of Rockwell Manufacturing Company. While these subsidiarires would continue to manufacture their respective products, the sales, service, and advertising of the group was conducted by the Power Tool Division. By combining all of the woodworking power machines into a uniform line, the assumption went, greater numbers of orders could be generated for all of the divisions, at the same time significantly reducing costs of operations by centralizing the services all under one management. By the end of 1949, demand for woodworking machinery lagged well behind production levels of just a few years earlier. With the loss of production in the Rockwell plants manufacturing power tools, the upper management could no longer justify having four separate plants producing machinery. One of the Rockwell plants would have to close. While rumors ran wild for a time about which plant it would be and Crescent employees were worried for their jobs, good faith was smiling on the people of Leetonia. 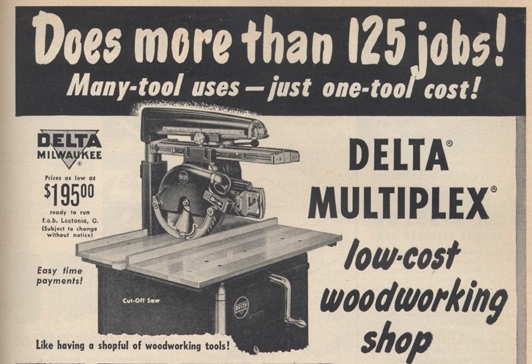 In December, 1949, it was announced that the Red Star plant, which had been renamed the "Delta Multiplex Division," in Norwalk, Ohio, would be shut down and all production of the Multiplex radial arm saws would be moved to the Crescent plant in Leetonia. Nearly overnight, the lack of production problem that had been plaguing the Crescent location for over a year suddenly appeared to be resolved; the extra production of the Multiplex line would put Crescent back at work at near 100 percent levels. The Multiplex radial arm saw was one of the few machines in the Rockwell lineup that was selling well at the time so in order to not effect overall production, the moving of the machinery to Leetonia was done in such a way as to not interfere with the numbers of machines rolling off of the assembly lines. Over about a two month period of time, over 40 new and modern machines were moved from Norwalk to Leetonia in about 50 truck loads, replacing about 25 older machines which were moved out of the way and sold. At the time that the transfer was complete, it was estimated that production at the Crescent plant would be roughly doubled, meaning that many laid off and part-time workers could return to work full time. In addition to the Multiplex saw, another new product, a re-designed Crescent/Delta 8-inch jointer was also being introduced in the Month of August, 1950, hopefully adding even more to the production levels for the factory. Throughout the late 1940's and early 1950's, Rockwell continued to make woodworking machinery at the Crescent factory under the Crescent, Delta and Rockwell names. By this time, all that was left of the original Crescent line was a handful of the more popular machines that continued to sell. In addition, production of the dual badged Delta/Crescent 20-inch Band Saw, 12-14-inch Table Saw and 8-inch jointer as well as the Delta Multiplex line of radial arm saws. All of the machinery was sold through the Rockwell Power Tool Division and all bearing the Delta brand. "Many of our old-timers will recognize that we have been building fewer and fewer heavy woodworking machines in recent years. To overcome this loss of work, we have attempted to substitute other machines to keep this plant operating on a reasonable basis. We cannot continue to keep production of these levels at Leetonia and tell our customers they cannot have them because of strike action. Therefore, it will be necessary for us to discontinue manufacturing the Cut-off saw at Crescent. Rockwell continue to manufacturer the old Crescent 12/14-inch Tilting Arbor Table Saws and the 20-inch band saws at other plants through the early 1960's under both the Rockwell and Delta brands. In the late 1940s, the Shopsmith, a power tool that contributed significantly to the growth of amateur woodworking, was placed on the market. It was a multipurpose machine, a five-in-one concept that was greeted lovingly by some and with skepticism by others, the latter group being woodworkers who couldn't understand why you would want to rearrange components to change from a table saw to a drill press. They also didn't like the fact that the machine had a tilting table (instead of a tilting arbor), though most people forget that many saws of the time were built that way. These are the words of R J DeCristoforo in 1999. (Click here for more background on DeCristoforo.) DeCristoforo takes justified pride in his role in promoting the Shopsmith as a legitimate power woodworking tool. His book, Power Tool Woodworking for Everyone, published first in 1953, to instruct Shopsmith owners on uses of the model 10ER Shopsmith, and the following year, another book -- a second edition, really -- dedicated to the new model, the Mark IV. DeCristoforo's manual was commisoned by Shopsmith, and quickly fearned the sobriquet, "The Shopsmith Bible"
In 1946, Dr. Hans Goldschmidt designed the Shopsmith, a home-craftsman's "combination" woodworking machine with a small, space-saving footprint -- 55 inches long and 21 inches wide. The Shopsmith comprises five main components: a 30" lathe, an 8" table saw, a drill press/mortising chisel, a disk sander, and a shaper. However, experience soon shows operators of Shopsmiths that you are limited to its uses only by your imagination. Countless variations in setups for a multitude of operations are possible. Today, 50-year old Shopsmith combo tools are prized possessions of many amateur woodworkers, myself included. These components are engineered to operate in both horizontal and vertical settings, perhaps the most compelling argument when considering this tool's merits. As Gordon B Ashmead notes, "all its functions the machine will perform its operations with efficiency equal to the best single-purpose tools of similar capacity". Optional accessories include a bandsaw, a jig saw, and a jointer cutter head. In a short five years on the market, from 1947 -- when the nationwide mail-order and department store corporation, Montgomery-Ward, began demonstrating and selling units -- to 1952, over 100,000 units sold, with the operation realizing $18.000,000 gross sales. (In 1948, its first full year, Magna sold $3,000,000 worth of Shopsmiths!) Other sources verify about how robust sales of the Shopsmith were between 1947 and 1952. In his article -- Document 11 -- Ashmead notes 75,000 units sold by 1950, while Skip Campbell (also in Document 11) claims that by 1952, the number sold was 125,000. To keep contact with users, a house organ, Shopsmith Shavings, was published. In the Newspaper Archives database, the earliest advertisement of Shopsmith is in Longbeach Press Telegram, Friday, June 4, 1948, page A-4. But this was just the first of a flurry that year, with a clustering around Christmas, in December. Along with the locally-owned hardware stores -- such as you see advertising here -- Shopsmith was sold the nationwide catalog organization, Montgomery Ward. The "Dean" of writers about home workshops, R J DeCristoforo, got his career launched when Shopsmith commissioned him, early in the 1950s, to write Power Woodworking for Everyone, which was published in 1953. However, some evidence suggests that his linkage with Shopsmith began in the late 1940s. (His wife, Mary Cristy, wrote a book -- Chicken Tonight - Feathers Tomorrow -- in 1999. Decristoforo's connection with Shopsmith is given in this book. Scrutinize the boxed text directly below, where DeCristoforo discloses that the first power tool he owned was a 10ER --. "It allowed me to work efficiently in my shop of that time, a 8' X 10' corner in an apartment basement. Nearly one million woodworkers have bought a Shopsmith, which gives you an assortment of power tools without taking tip much more space than a couple bicycles. I admit to a degree of fondness for the machine because the introductory model, the 10ER, was my first power tool. It allowed me to work efficiently in my shop of the time, an 8' x 10' corner of an apartment basement. Whatever I did with the tool impressed the manufacturer enough to transport me from New York to California so I could produce the Shop-smith bible, Power Tool Woodworking for Everyone. There have been transformations since then in the tool, manufacturers and my interest in tools generally. But one factor seems perennial, the camaraderie that exists among users of multipurpose machines. Source: R. J. DeCristoforo, The Jigs and Fixtures Bible: Tips, Tricks and Techniques for Better Woodworking. Cincinnati: Popular Woodworking Books, 2001, page 15. Wally Kunkel looms as one of the flamboyant promoters of woodworking, especially amateur woodworking, in the latter half of the 20th century. His book, How to Master the Radial Saw, is still being sold on the Internet, and his beloved radial arm saw -- now a "dinosaur" tool that has been replaced in woodworking shops by the compound sliding miter saw -- which he champions, is only a treasured possession of died-in-the-wool amateur woodworkers like myself. This was the beginning of the most exciting time of my life, the great Do-It-Yourself era. Veterans had returned from the War and had "to do it themselves". (They also wanted to!) They came to the Home Shows across America, literally, in droves. Shopsmith was the "big" name. It was, and is, basically a lathe turned into a half-dozen other machines. Their original factory demonstrator was a fellow by the name of "Red". I don't remember his last name, but he was a master of woodturning. The wood seemed to melt under his chisel into fantastic shapes. He was also a great showman! My goal, like many others, was to own a Shopsmith. I wanted one so badly I could taste it! At that time, I worked on Madison Avenue and 40th Street, NYC. Directly across the street was a Patterson Brothers tool store, and I went out of my mind every noon hour. They sold, and they demonstrated, my Shopsmith! My wife and I were having the first of our six sons and one daughter. Marc, my oldest, had outgrown his crib and needed a bed. We liked "Early American", so my wife, Jean, told me I should buy one for him. I did. I went to Altman's and paid $150 for it (a lot of money in the 1940s!) When it was delivered, Jean phoned me at the office and said, "This bed's not worth the money. How much is that Shopsmith?" "$350," I answered, hopefully. And she said, "Buy it!" I then found out there was such a thing as a lumberyard that sold only hardwoods. I'd never heard of such a thing! It was in the bowels of Newark, but I would have found it if it had been in Timbuctoo. I told them I wanted Maple, "Three inches thick." My father, a farmer in Missouri, came for a visit later. I asked him, "How do you like the bed?" "Where did you find that nice Birch?" he asked. "Nope. It ain't Maple. See that little freckle in the end-grain? That's Birch." "Anyway," I said. "It's 12/4!" This was the beginning of an addiction that resulted in my building an "Early American" house, 10 rooms of furniture, and searching for a way to get out of the advertising business and into the world of woodworking, as fast as possible. When AMF bought DeWalt, I had my answer. I said, "Sam, we can sell $1,000,000 of DeWalts, per year, in the north 10 counties of New Jersey a-lone!" After he hired Conde Hamlin for National Sales Manager, they both showed up in New York, took me to Rockefeller Center for a nice lunch, and said, "DO IT!" While Conde put together a sales force of 30 District Managers across America, I did the original marketing and sales promotion. How can you not be impressed with a small, lightweight tool that can substitute for a handsaw, portable circular saw, jig-saw, hand saw, coping saw and keyhole saw? With a pivot guide it can saw perfect circles, and it can form its own starting hole. According to DeCristoforo, importers "soon" (?) had considerable competition from American manufacturers, which resulted in added features and lower prices. 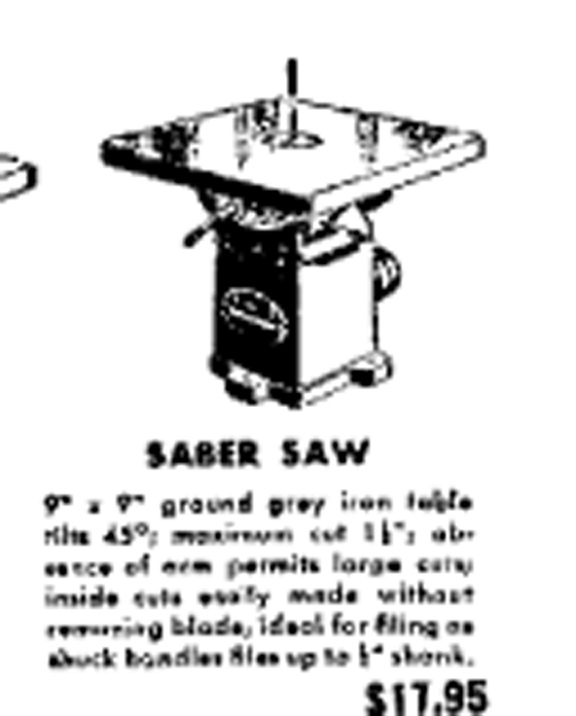 Mentions of the term "saber saw" in American newspapers occur early the 1950s. Below is an image captured from an advertisement in the newspaper, the Review, published in East Liverpool, Ohio, June 18, 1951, on page 37. 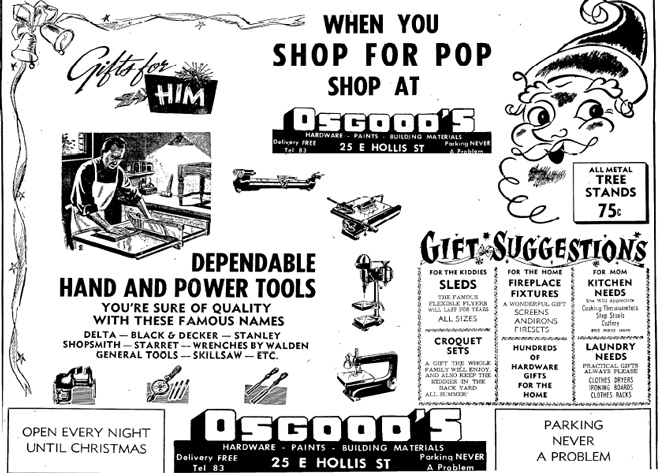 In that day's issue, a local hardware store, Milligan's, ran a full page advertisement on tools, with about twenty-five percent of the page taken up by tools manufactured by Sprunger. 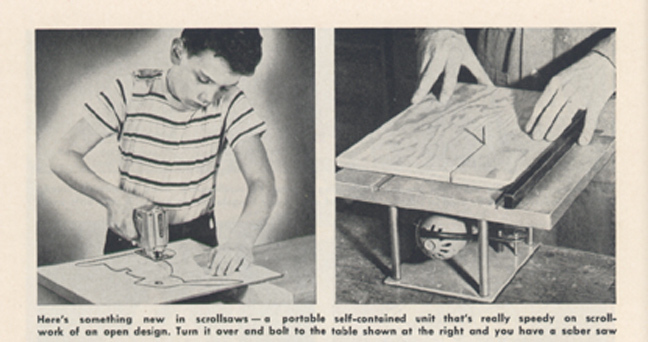 Portable scrollsaw: Shown on page 48 [above] is something comparatively new in scroll-saws. It does the work of a scrollsaw, band-saw and saber saw all in one unit. The table shown in the right-hand photo is furnished as an accessory. Due to the comparatively heavy, stiff blade, extremely intricate scrollwork cannot be done, of course, and the short length of the blade limits the depth of cut. In this it cannot, of course, be compared with either the handsaw or scrollsaw. The short blade is driven at high speed and on long-radius work it cuts very smoothly. Source: W. Clyde Lammey, Power Tools and How to Use Them Chicago: Popular Mechanics Press, 1950, pages 48-49; this same image and text is also published in volume 10 of Popular Mechanics Do-It-Yourself Encyclopedia for Home Owner, Craftsman and Hobbyist, in twleve volumes. New York:L J J Little and Ives, 1956, no page numbers given. In the New York Times, the earliest note the saber is June, 1955 -- see box below. [Stanley, Black & Decker, Millers Falls, Porter-Cable, Sears, Wen and others produced saber saws with about a $50 or $60 price tag. Some were as low as $30. Disston,famed for its handsaws, even produced a 5-pound saber saw that had a handle that duplicated the one on its famous D-23 handsaw]. Complete with three replacement blades, an electric saber jig saw is claimed to substitute for most other power saws in the home workshop, yet costs only a fraction as much. The portable unit will bore its own hoes through wood, can be used to cut waxllboard right on the wall, and can be used as a portable rip, crosscut, scroll, keyhole or coping saw, according to the maker, with an accessory table, it replaces a band of jig units. Mitre guides, extra blades, a circle guide and a sander attachment are available. Saber Saw is $55, table accessory $19.95 and mitre guide $9.95 at hardware stores. Forsberg Manufacturing Company, Bridgeport 1, Conn.
Porter-Cable entered the router business in 1948 with the purchase of the Unit Electric Company. Rather than manufacturing their own units, from 1948 until 1950, Porter-Cable simple put their nameplate on the Unit. Electric tools. Unit Electric manufactured two models of routers. In 1950 Porter- Cable introduced their own design, the model 100, a model that Porter-Cable produced until 2006. Using the label, Guild, Porter-Cable introduced a line of accessories, including components for converting the router into a portable plane or a bench top shaper. Above is a fragment from an advertisement in the San Antonio Light 11-14-1950. The occasion evidently included a factory representative demonstrating the tool. Notice that Porter-Cable called the router the "Guild Power Router". From evidence located in the newspaperarchive.com, Porter-Cable advertised heavily -- this advertisement is typical -- throughout America immediatley following WW II. Outside of the newspaperarchive.com database, the results of searches for evidence of routers in the 1940s is disappointing. For example, for the 1940s decade, the Reader's Guide to Periodical Literature yields no relevant hits on routers. (While the RG is only one of a handful of indexes that cover topics of technology in this era, the lack of hits in it indicates that, as a topic, routers are not important tools in this decade. How do we know? The RG that indexes "selected" articles -- but not every item -- published in issues of titles such as Popular Science, Popular Mechanics, Industrial Arts Magazine and Industrial Arts and Vocational Education. What this policy means is that brief news notes -- which might include news of a new router on the market -- are ignored by the indexers of RG. Past experience with PS and PM tells us, though, that these two "popular" science and technology magazines generate their mass circulation by having news important for a broad spectrum of their reading public, especially for science and technology topics. Routers, as tools of the woodworking trade, and potential tools in homeworkshops, certainly fall into that domain.